The 1 oz gold coin in the Proof Gold American Eagle collection is the longest-running option. 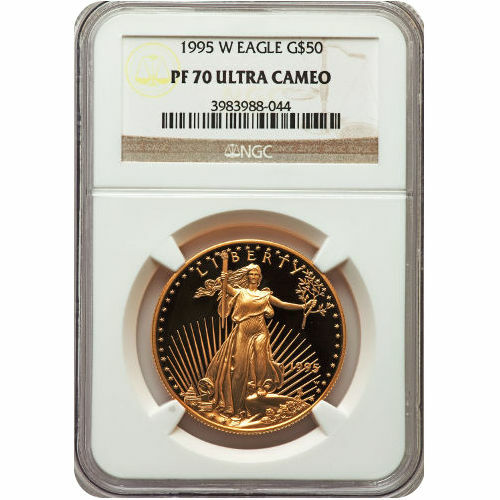 Offered from the beginning in 1986, the 1 oz Proof Gold Eagle has proven itself one of the most popular choices among the four weights available for collectors to purchase. 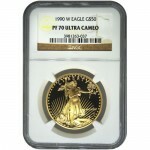 Today, 1995 1 oz Proof Gold American Eagle Coins are available to you online at Silver.com in perfect condition. Coins ship to you inside of the NGC’s protective plastic slabs! 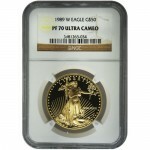 10th-anniversary release of Proof Gold American Eagles! Availability limited within the original 46,368-coin mintage! Consists of One Troy ounce of actual gold content. The face value of $50 (USD) is fully backed by the US government. Graded PF70 by the Numismatic Guaranty Corporation. Issued with a UCAM label. The obverse face of the coin includes the famed Liberty design. On the reverse face of the coin is a family of bald eagles. The United States Mint celebrated the 10th-anniversary release of its Gold American Eagles in 1995. 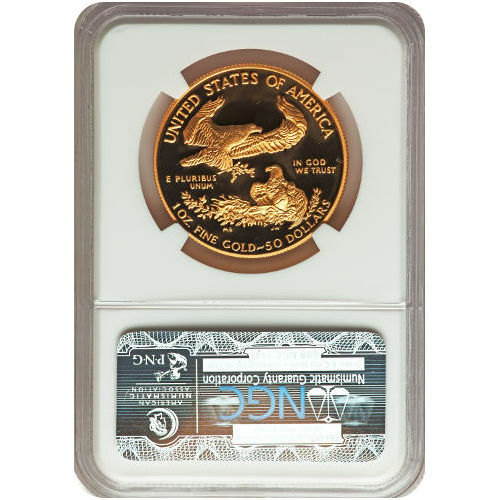 Typically, the mint issues its Proof Gold Eagles individually and in four-coin sets each year. For the 10th anniversary, a five-coin set was issued that included all proof eagles issued by the mint. This set included all four weights in the Proof Gold Eagle range, along with a special S-Proof Silver Eagle struck by the San Francisco Mint. 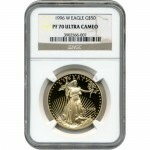 All of the 1995 1 oz Proof Gold Eagle coins in this listing earned PF70 certifications. The NGC issues a PF70 grade to coins that have full, original mint luster and lack all possible detracting flaws. The UCAM label indicates visual contrast between the strong, frosted design elements and the deeply-mirrored, clear background fields. On the obverse of all Proof Gold American Eagle coins is the impressive Lady Liberty design created in 1907 by Augustus Saint-Gaudens. When the design appeared on the $20 Gold Double Eagle, it was the first of many new coin designs to come on American coins during an era of revitalization for American currency designs. The reverse face of the 1995 1 oz Proof Gold American Eagle features a unique design from Miley Busiek intended only for use on the Gold American Eagle collection. The images featured here include a male eagle flying above the nest as a female shelters a hatchling under her wing. Please feel free to reach out to Silver.com if you have any questions when buying gold. You can call us at 888-989-7223, chat with us live online, or simply send us an email with your inquiries.